Transportation Services – Our center provides convenient, high quality transportation services for J-1 students at low cost. 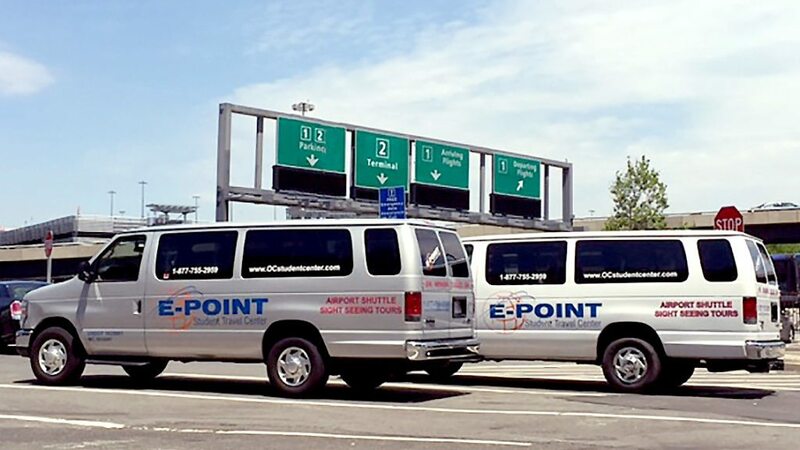 For many years E-POINT is specializing in Airport transfers. Every year, thousands of international students are using our airport shuttle service, because it is convenient, affordable and quality. We worked out the system that works with every work and travel student. We also have weekly trips to Washington DC, New York, Philadelphia and special seasonal trips to Niagara Falls, Boston and Chicago areas. We are also able to arrange special trips based on customer’s request. Go to our Travel trips section of this website where you can find detailed description of discounted travel destinations that you always dreamt to visit. E-Point provides hassle free door to door daily transportation service with convenient schedule and low price. We are fully insured and licensed, authorized by the U.S. Department of Transportation (DOT); Licensed by Maryland Public Service Commission. E-POINT takes great pride in the cleanliness and reliability of our fleet, as well as the safety record of our professionally trained, experienced drivers.